Take Action: Order Now. New York Times Best-Selling Author’s 9/11 Truth Novel Hits Stores January 22! Today we have an amazing opportunity, if we work together, to launch 9/11 truth into a new mainstream American paradigm. Today, we have an opportunity to explode 9/11 truth issues into the mainstream mind, in the form of a soon to be released popular action fiction novel by New York Times Best-Selling Novelist, Steve Alten (stevealten.com). If we can help get 30,000 copies of this profound novel purchased in the first month of its release, we can drive it to #1 on the New York Times best seller list. (Please see the message from Steve, below). The 9/11 truth movement can do this, if we ALL push for it to happen. Why is this such an incredible opportunity? 1) It is written by a New York Times Best-Selling novelist. He’s established an “adopt-a-writer” program, that has connected him with hundreds of English departments/teachers in high schools all across America, and has donated many copies of his book to US troops overseas, with a huge audience there. 2) Americans love action fiction (which The Shell Game definitely is). 3) The publisher has already purchased prime display space in the front of Barnes & Noble and Borders stores for its release. 4) The author’s webmaster has created a website for the book’s release that includes major 9/11 truth websites, youtube video links, and recommended non-fiction reading on 9/11. We, the undersigned, urge everyone seeking truth, peace and justice, to not only purchase this new novel, “The Shell Game,” but also to email out this appeal to all you know who seek truth, peace and justice in the form of 9/11 truth coming out. In turn, please urge them to do the same with all their contacts and urge them to do the same. We can break 9/11 truth open if we work together and focus on this project for the next 30 days. When the monsters in the story are our own elected officials who committed treason, then the horror becomes a little too real. He was WRONG! The SHELL GAME did sell, and could be the next Da Vinci Code…with YOUR HELP! On January 22, 2008, 40,000 first-edition hardbacks will appear in major bookstores around the country, appearing on front tables at Barnes & Noble and Borders, and in major airports. WITH YOUR HELP we can turn a fictional thriller into a message to the mainstream. YOUR 9/11 TRUTH MESSAGE! A message that has been ignored by the majority of Americans. A message that may finally sink in. And when these Americans read this addictive page-turner, they shall feel what I felt: Shock. Anger. Betrayal. Frustration. And they shall come to realize what I now realize… that the 9/11 Truth Movement are the real patriots in 21st century America! Yes…I combed your sites and watched your videos. But as I began reaching out to the 9/11 organizations, I realized the movement has been fractured by both outside and internal forces that blur the truth by twisting and contorting the message or attacking those they disagree with in varying shads of gray. United we stand, divided we flounder behind “conspiracy theorists” and “lefty liberal wacko” labels. The truth was lost behind a Tower of Babel. And suddenly the success of the book took on a whole new meaning. You see, THE SHELL GAME represents the truth…only it doesn’t bash its way through mainstream America’s front door, it sneaks in the back door…as entertainment. THAT WE demand new 9/11 investigations! THAT WE will not be silenced any longer! And yes, the enemies of truth will come forth as they always have. Right wing political pundits will accuse me of being a conspiracy theorist — part of the “left wing wackos.” In truth, I am a registered Democrat, but I am far from a liberal and the Dems feel my wrath in the story as well as the Republicans. To my delight, this book was published by a Mormon conservative group out of Utah — a traditional red state. Black is the color of oil and coal and the carbon dioxide it delivers into our atmosphere every day – 70 million tons of it. Black is the ledger of the oil companies, created by billions of dollars in profits that support Middle Eastern governments (kept in place too often by our foreign covert policy (ie Syrianna), who care little about their own people. Those same billions allows the fossil fuel industry to lobby and coerce our politicians, who in turn, allow them to continue to pollute. Black is the color of cancer and death; the color of minorities who perished in New Orleans because it was too costly to fix the problem, and the color of blood as it bleeds from a bullet wound and mortar fire. Black is the heart who loses a loved one in a war they know is unjust. Finally, black is the date that will appear on the calendars of all those who witness the blackest date in our history. . . when a nuclear device explodes in one of our cities, incinerating tens of thousands, radiating millions, and staining what remains of our civilization forever, and the increasing probability that that attack won’t come from so-called enemies abroad, but from within, to cow us into endless war. Green is the solution that can prevent the catastrophe. It is the color of clean energy and the new economy it brings. It is the color of our environment as we reverse the effects of climate change, reducing CO-2 emissions in the air, soothing our planet’s temperature. Green is the color of money, which is why green will never be allowed to positively impact our civilization as long as oil is black. Six years and four months have passed since the crimes of 9/11. The guilty remain free, the whistle-blowers troubled, and YOU, the patriots of truth, have been battered and threatened and punished just as our constitution has been trampled upon. HELP ME HELP YOU! For the first time YOUR EFFORTS can be quantified on a weekly basis. When The SHELL GAME peeks its head onto the NY TIMES best-seller lists, YOU WILL HAVE STRUCK A BLOW FOR TRUTH. When the book hits #1…America will be listening! All of YOUR BOATS shall rise with this tide, all of your bloggs and websites and videos and DVDs shall be watched by a new audience…an audience that read the book and DEMANDS MORE INFORMATION. Your rallies shall be new launching points for real change and new investigations…IF WE REMAIN UNITED. Let the book rally the tower of Babel so that mainstream America finally hears your message in a focused, deliverable venue…A NOVEL! And may your united efforts strike down the imposters who attempt to stand in our way. –because look where red and blue have gotten us. . . The events of September 11th, 2001…the invasion of Iraq…the threat of radical Islam…an impending showdown with Iran. What do these situations have in common? Oil. And the world is running out. 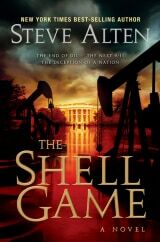 The SHELL GAME is far more than a thriller, it is a MUST-READ cautionary tale that exposes the next “9/11 event” a deception that will lead to a retaliatory chemical weapons strike on Iran and the terrorist elements the regime supports. 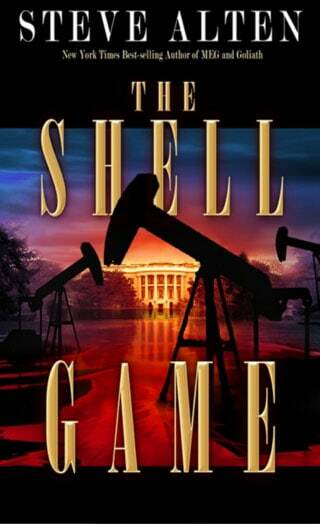 Though the novel is written as fiction, it is filled with all-too-real details provided by insiders in the oil industry, military, and Middle Eastern affairs that extrapolates real events from the past and present that will lead us down a path of self-destruction…unless we stop the insanity now! The story opens in 2007 when two CIA spooks meet with an American Colonel in military intelligence. The war is going badly, and President Bush, who steadfastly refuses to back down, remains unchallenged at home as Democrats and Republicans continue to toss verbal grenades — positioning themselves for the 2008 elections. Meanwhile, Iran’s pursuit of nuclear energy will yield enriched uranium within five years — uranium that can be used to manufacture suitcase nukes. The United States’ military is too drained to invade Iran, and a preemptive strike is out of the question…unless a nuclear detonation were to occur on in American city — the enriched uranium traced back to Iran. A U.S. reprisal would strike a death-blow against radical Islam, quell the insurgent violence in Iraq…and yield more oil. Yes, the cost is unthinkable — but if we sit back and do nothing then one day a dozen suitcase bombs could go off in a dozen American cities — bringing with it anarchy and the collapse of Western civilization. December 2011: Ashley “Ace” Futrell is an oil expert working for PetroConsultants, married to Kelli Doyle, a former National Security Advisor and one of the CIA spooks from the opening scene. When Kelli threatens to expose the plot, Ace finds his existence hurtling down a rabbit’s hole of deceit where the orchestrated lies of the powerful few could lead to the darkest days of human existence… and the death knell for billions.